Hello my lovely readers, I have a real star of a recipe today. If you have spent anytime on this site, then you’ll know I’m a bit bonkers about all the flavours in a Bakewell Tart. 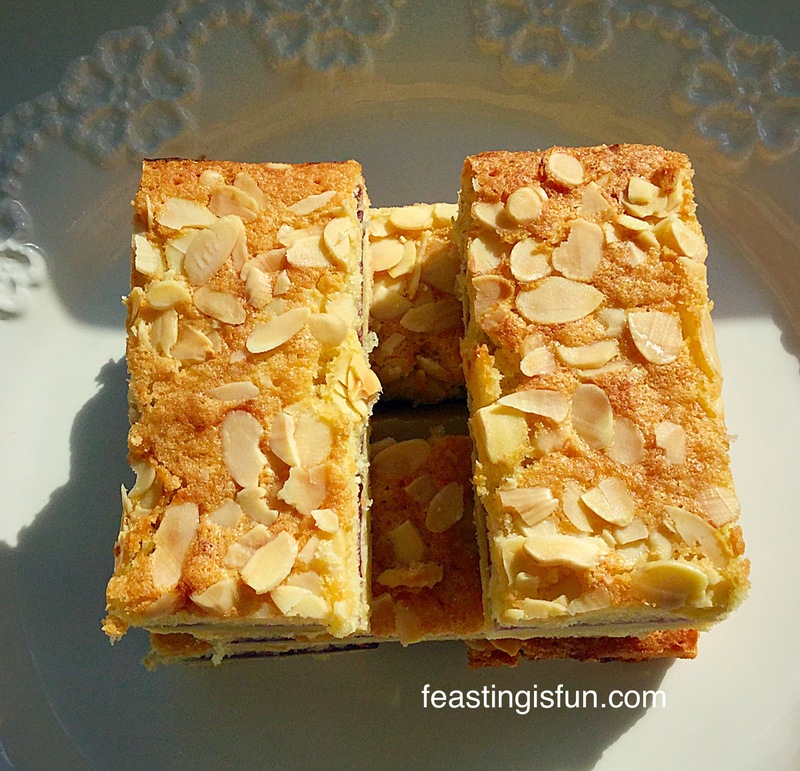 And so I have made these very delicious Bakewell Shortbread Bars. These actually came about by accident, sometimes that’s the best way with recipes! Because I had made some vanilla shortbread dough, which I had planned to turn into chocolate dipped hearts. Anyway, what with one thing and another, I didn’t get around to making them. Update: I have made them and the recipe is here Chocolate Dipped Shortbread Heart Cookies. So, a couple of weeks ago, on a Sunday, Hubby was running through what we had for packed lunches that week. I hadn’t managed to make any Cranberry Walnut Flapjacks eek – then I had a moment of inspiration. 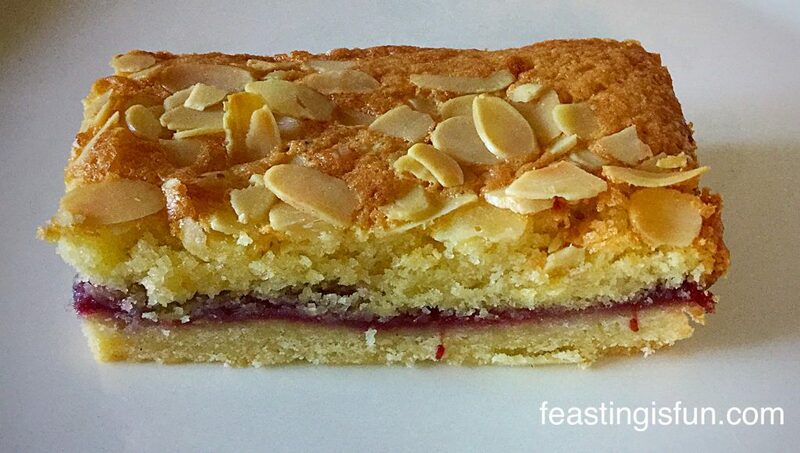 These Bakewell Shortbread Bars are the result of me needing to make something delicious, that also travels well. Bakewell Shortbread Bars perfect with a cup of tea. What a massive hit these have been with my family, ooh and me! 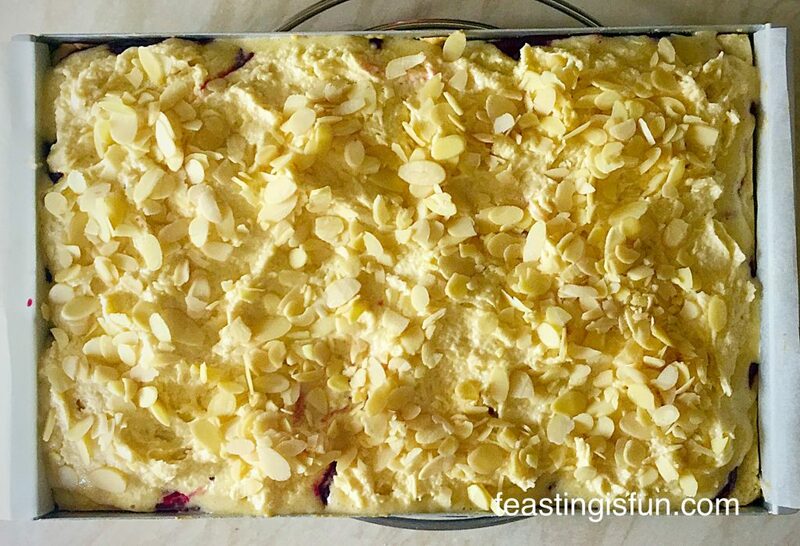 Since the buttery shortbread base gives these Bakewell Shortbread Bars a sturdiness that is needed when food is to be transported. Topped with delicious raspberry jam, giving a hint of sweetness and then covered in a light, tender almond sponge with flaked almonds added for crunch, flavour and decoration. While I love Bakewell Tart, what I really love about this recipe, is that there isn’t any pie crust to roll out. With a pastry crust I certainly don’t want a big, thick wodge of it at the bottom of my bar, whereas, using shortbread dough I am more than happy to have a decently thick base. 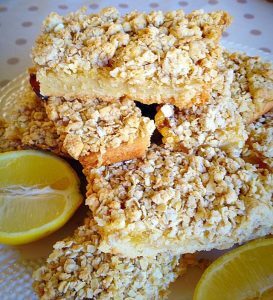 Bakewell Shortbread Bars such an easy recipe. 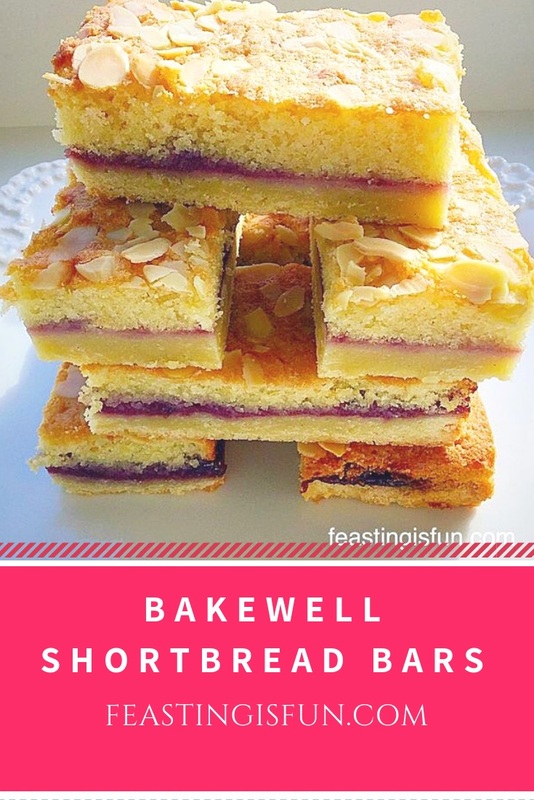 Because these Bakewell Shortbread Bars hold together well and I will definitely be making them for picnics throughout the warmer months. I am not a fan of packing up food for lunches or picnics that is overly sweet or has any form of icing. I guess it just becomes too much of a bug magnet, or even worse wasps – and cupcakes/iced cakes just get too messy. Although our children are in their teens now, I want to relax while eating outside, not constantly dodging bugs or clearing up melted buttercream. That is not my idea of fun! Actually, one year that we went to the beach with a big croud of friends, I made a fruit cake and a lemon drizzle cake (I know but the lemon drizzle only had a little bit of icing). I pre-cut them, popped the cakes into tins and mid afternoon we all had a cup of tea and slice of cake. I remember it being a very relaxing happy day and these Bakewell Shortbread Bars would certainly have travelled well and been enjoyed. A must bake for this year’s beach outings! Now when I say this recipe is simple, it really is, the only slight faff is pre-cooking the shortbread. And I only say slight, because whilst the shortbread is cooking it is the perfect time to whip up the sponge. You will need a swiss roll tin 28cm x 20cm x 5cm (12″ x 8″ x 2″) greased with butter and lined with baking parchment. In a large bowl whisk/beat the butter and sugar together until pale and creamy. Add the vanilla extract and egg yolk and whisk/beat until combined. Sift the flour and salt into the bowl. Mix using a spoon until the dough comes together. Tip the dough out on to some cling film. Wrap up the dough into a disc shape and place in the fridge to chill for 30 minutes. Once chilled break the dough up into large pieces and place them into the prepared tin. Using clean hands, press the shortbread dough into the tin so that it forms a uniform layer. 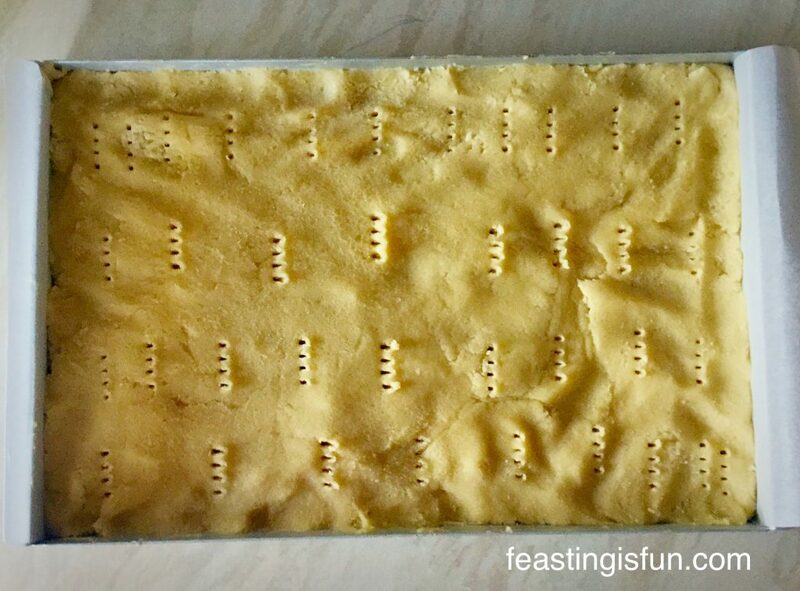 Dock the shortbread dough using a fork. The shortbread base ready for the oven. Place the tin into the oven and bake for 10 minutes. Remove the tin after 10 minutes and spread the jam over the part cooked shortbread. Leave a small gap between the jam and the edge of the shortbread. Turn the oven temperature down to 160C/140C fan, gas mark 3. The part cooked shortbread is slathered in raspberry jam. In a large bowl whisk/beat the butter and sugar until pale and creamy. Add the vanilla and almond extract and the 3 whole eggs. Whisk/beat for 1 minute. Add the flour, ground almonds and salt. Mix slowly until the batter is just combined. 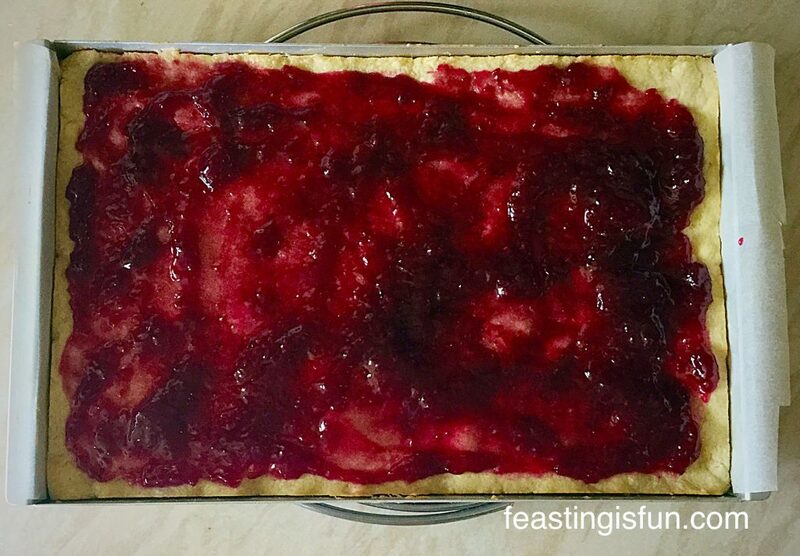 Spoon the cake batter over the jam coated shortbread. Almond sponge is spooned on top of the raspberry jam covered shortbread. Place the tin into the centre of the oven and bake for 25-30 minutes. It is fully baked when the top is golden and feels firm to the touch. As soon as it is baked remove the tin from the oven and allow to cool completely in the tin. When completely cold run a knife around both long sides of the tin. Using the spare parchment paper, lift the cake covered shortbread free from the tin. Cut down the middle length of the bake. Then cut across the width, in the middle. Now cut each quarter into 3 bars. 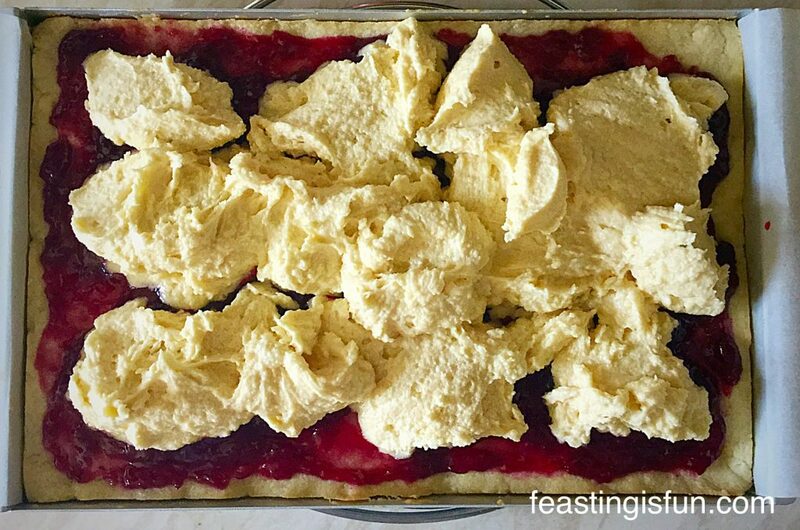 Use a palette knife to lift the Bakewell Shortbread Bars free from the baking parchment. Bakewell Shortbread Bars who will you share them with? 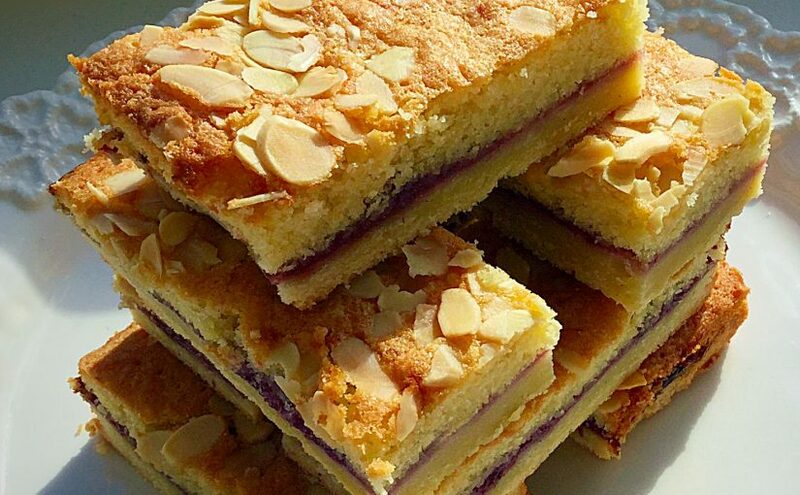 How great do these Bakewell Shortbread Bars look? Store them in an airtight container for up to 5 days. 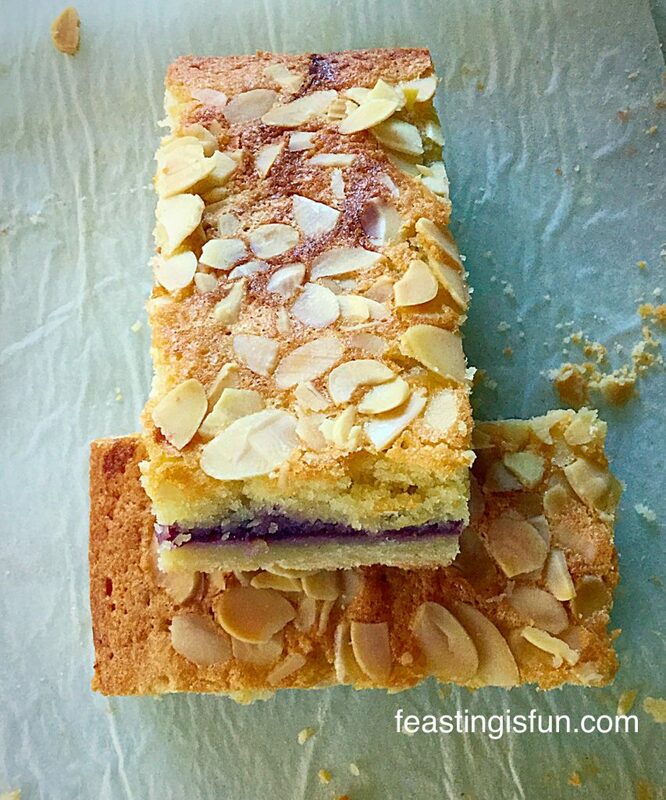 Bakewell Shortbread Bars almond sponge, raspberry jam and shortbread base – perfect! See! So easy to make. Such a brilliant addition to a packed lunch, picnic or just to have with a cup of tea or coffee. I love recipes that are easy, yet produce stunning results. This is one of those recipes. Because all of the flavours work so well together – buttery shortbread base, sweet/tart raspberry jam and almond sponge – the perfect combination. 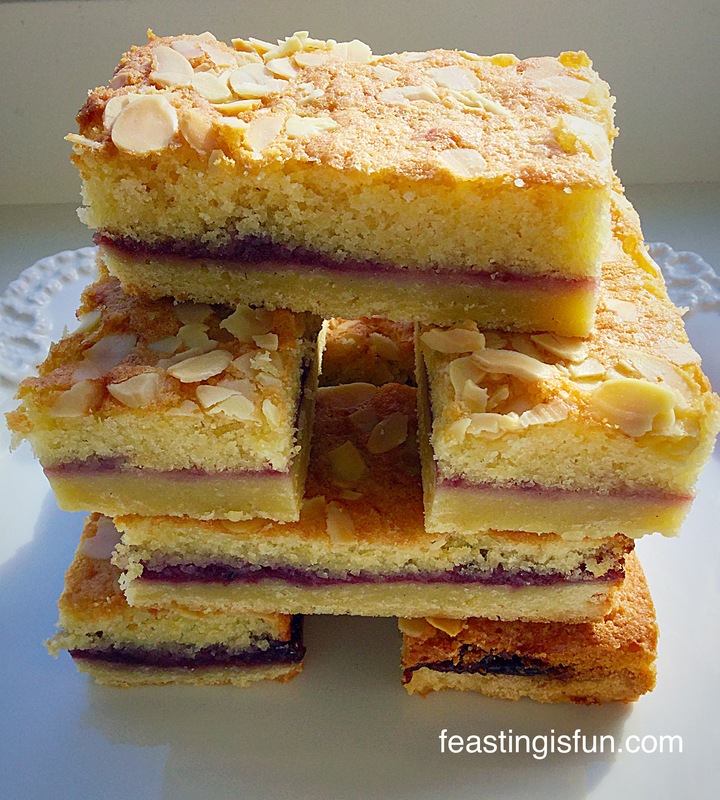 Finally you can have your cake and cookie all in one tasty Bakewell Shortbread Bar! 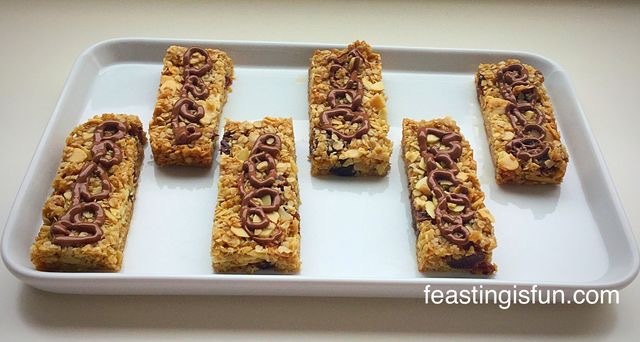 Cranberry Walnut Flapjacks perfect to grab and go. 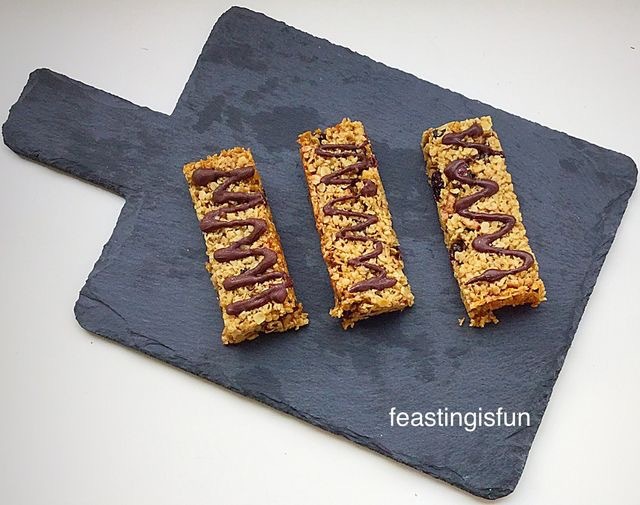 Coconut Date Almond Flapjacks healthy food to go. Do you have favourite recipes for making good food to go? Thank you for taking the time to leave a comment. I really appreciate it and love reading them. If you are on Twitter or Instagram please pop a photo up and tag me in. I love to see what you are baking and making in your kitchens and will happily retweet your pictures. Whatever you are making, have lots of fun making your feasts and sharing with friends and family. These sound amazing! Look forward to putting them together!!! Thank you Ted. I hope that you enjoy them in your home as much as we do in ours. Sammie. These are gorgeous, Sammie! I hope to try them soon (I think the hubby would love them, but would have to skip the almonds on his share! More for me!!!). 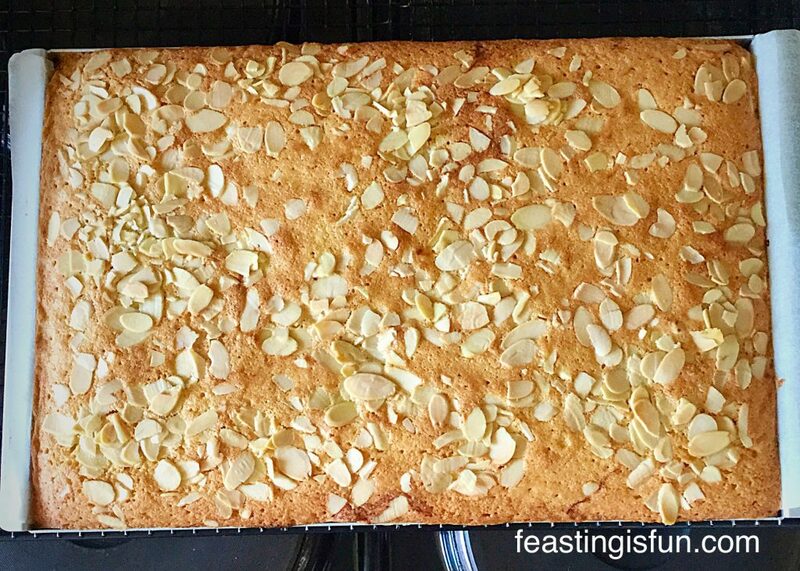 Shortbread and almond sponge…what a heavenly combo! They would be great for the mother’s day buffet lunch! Ooh yes Angie it would be. The two layers do compliment each other with raspberry jam in the middle. Have a great weekend. Sammie. Hi Pam, thank you for your comment. The tin used is Delia Smith Online Silverwood Swiss Roll Tin available from Amazon U.K.
Oxo Good Grips also sell a tin of the same size, as well as a deeper version (which I sometimes use for traybakes) also available from Amazon U.K.